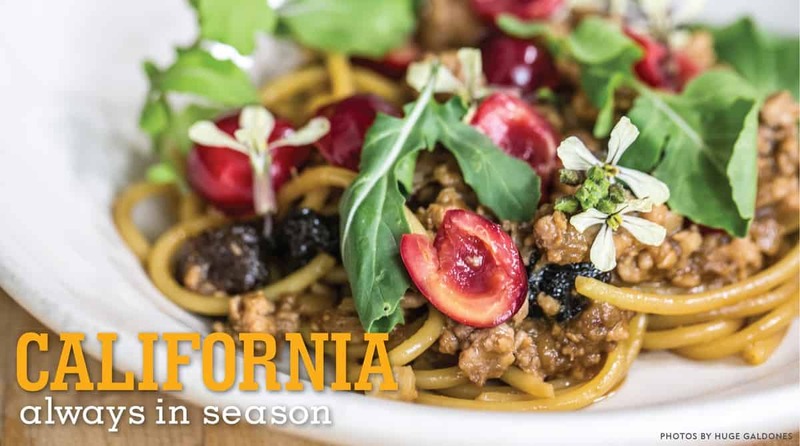 Showcasing the versatility of the Sweet Cherries from Lodi Farming, Chef’s Sarah and Evan Rich from Rich’s Table in San Francisco use cherry juice and a bouquet of cherry pits to make this Bolognese, then top the dish off with house-made pickled cherries. Using a large, heavy-bottomed pot, melt the butter in the olive oil. Add the onions and cook until translucent. Add the carrots and cherries and cook about 3 more minutes, stirring well. Add the ground pork and the teaspoon of salt. Brown the pork, making sure to crumble the meat as it cooks. Add the cherry juice and cook until almost dry. Add the milk and cook very gently until it has all cooked into the meat. Add the wine and cook gently until it has cooked away. Add the tomatoes and stir thoroughly. Add the sachet of cherry pits. When the sauce begins to bubble, turn down the heat until it is at the lowest of simmers, only a little bubble here and there. Cook, uncovered, for 3 to 4 hours, stirring occasionally. If the sauce begins to dry out too much, add a few tablespoons of water as it cooks. Adjust for seasoning with salt and shiro dashi to taste. Heat vinegar, water, sugar, and salt together until it just comes to a simmer and sugar and salt are dissolved. Pour the hot liquid over the cherries and allow them to cool. Cook bucatini pasta in boiling salted water until just al dente. Toss with the Bolognese sauce. Serve pasta in wide, shallow bowls. Top with pickled cherries and young, tender, mustard greens.